Package: 22oz bottle, purchased at Zipp’s Liquors in Minneapolis. Sampled from my Rodenbach Grand Cru tulip. The moment I opened the bottle, a fruity sourness filled the kitchen. Smells of mangoes, star fruit, and hints of marmalade give way to the aroma of mandarin orange vinaigrette, a very nice sweet-and-sour effect. I can’t wait to taste this beer! My pour revealed an orange-copper beer with a delicate, 2-1/2 fingered head. The head collapsed in a couple minutes, leaving just minimal lacing. Right up front, the taste is more tart than sweet. 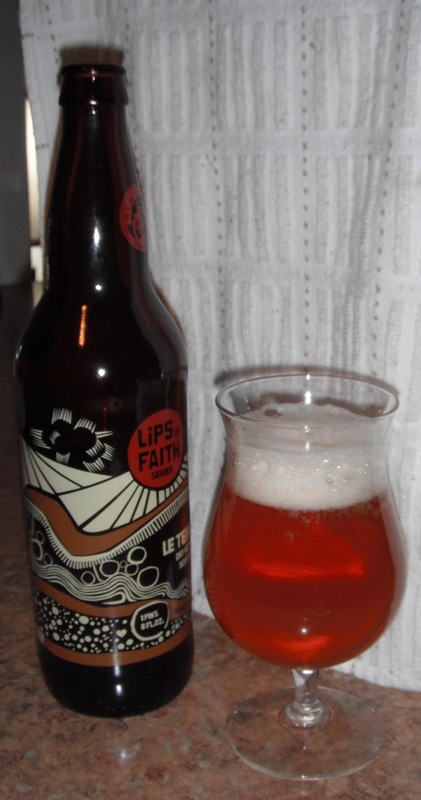 A tongue-puckering sourness mixes with slightly sweet cereal grains, leading to more of what I found in the aroma – mango, orange zest, lemon, sour oranges, and orange juice. Ends with another generously tart pucker, similar to the way fresh orange juice finishes, but maybe mimosa is a more apt comparison. A decent bitterness develops over time, and as the beer warms it also reveals a light grassiness. Mouthfeel is initially a blend of pucker and juice, but dries out over time, seemingly as a corollary to bitter component. Medium body. The carbonation is a little lighter than I expected, but works well with the flavors, letting my tongue bask in the juicy tartness. Finishes quite dry. Overall, I say “delicious.” This beer is definitely a sipper, a good beer to enjoy with an evening-finishing, thought-provoking book — it took me an hour and a half to drink the bottle.